Nazareth is not mentioned in pre-Christian texts and appears in many different Greek forms in the New Testament. There is no consensus regarding the origin of the name. It must be noted that, in their scriptures, the Mandeans mention nasirutha as a place they go. “Nazareth” assumes several forms (Nazara, Nazaret, Nazareth, Nazarat, Nazarath) in surviving Greek versions of the New Testament. 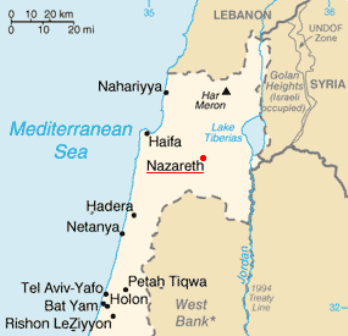 Many scholars have questioned a link between “Nazareth” and the terms “Nazarene” and “Nazoraean” on linguistic grounds, while some affirm the possibility of etymological relation “given the idiosyncrasies of Galilean Aramaic.” Of the twelve appearances of the town’s name in the New Testament, ten use the form Nazaret orNazareth, and two use the form Nazara. Nazara (Ναζαρα) is generally considered the earliest form of the name in Greek, and is found inMatthew 4:13 and Luke 4:16, as well as the putative Q document, which many scholars maintain preceded 70 CE and the formation of the canonical Christian gospels. The form Nazareth appears once in the Gospel of Matthew 21:11, four times in the birth chapters of the Gospel of Luke at 1:26; 2:4, 2:39, 2:51, and once in the Acts of the Apostles at 10:38. In the Gospel of Mark, the name appears only once in 1:9 in the form Nazaret. The form Nazara is also found in the earliest non-scriptural reference to the town, a citation by Sextus Julius Africanus dated about 200 CE. (See “Middle Roman to Byzantine Periods” below.) The Church FatherOrigen (c. 185 to 254 CE) knows the forms Nazara and Nazaret.Later, Eusebius in his Onomasticon (translated by St. Jerome) also refers to the settlement as Nazara. The first non-Christian reference to Nazareth is an inscription on a marble fragment from a synagogue found in Caesarea Maritima in 1962. This fragment gives the town’s name in Hebrew asnun·tsade·resh·tav. The inscription dates as early as c. 300 CE and chronicles the assignment of priests that took place at some time after the Bar Kokhba revolt, 132-35 CE. (See “Middle Roman to Byzantine Periods” below.) An 8th century CE Hebrew inscription, which was the earliest known Hebrew reference to Nazareth prior to the discovery of the inscription above, uses the same form. One theory holds that “Nazareth” is derived from the Hebrew nounne·tser, נֵ֫צֶר, meaning branch. Ne·tser is not the common Hebrew word for “branch,” but one understood as a messianic title based on a passage in the Book of Isaiah. The negative references to Nazareth in the Gospel of John suggest that ancient Jews did not connect the town’s name to prophecy. Alternately, the name may derive from the verb na·tsar, נָצַר, “watch, guard, keep. Another theory holds that the Greek form Nazara, used in Matthew and Luke, may derive from an earlier Aramaic form of the name, or from another Semitic language form. If there were a tsade in the original Semitic form, as in the later Hebrew forms, it would normally have been transcribed in Greek with a sigma instead of a zeta. This has led some scholars to question whether “Nazareth” and its cognates in the New Testament actually refer to the settlement we know traditionally as Nazareth in Lower Galilee. Such linguistic discrepancies may be explained, however, “by a peculiarity of the ‘Palestinian’ Aramaic dialect wherein a sade (ṣ) between two voiced (sonant) consonants tended to be partially assimilated by taking on a zayin (z) sound. 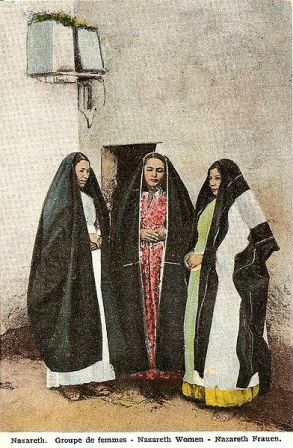 The Arabic name for Nazareth is an-Nāṣira, and Jesus (Arabic: يسوع‎‎,Yasū` or Arabic: عيسى‎, `Īsā) is also called an-Nāṣirī, reflecting the Arab tradition of according people a nisba, a name denoting from whence a person comes in either geographical or tribal terms. In the Koran, Christians are referred to as nasara, meaning “followers of an-Nāṣirī,” or “those who follow Jesus. 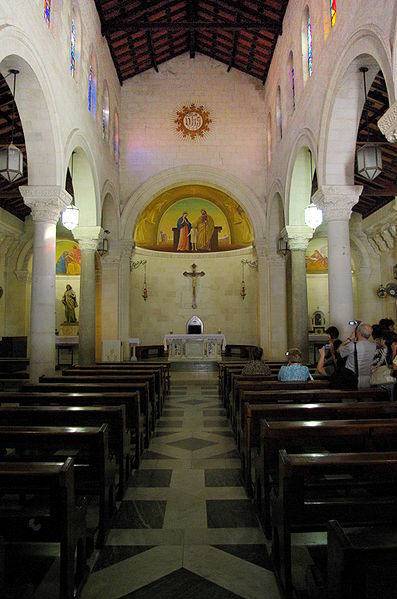 Two general locations of Nazareth are attested in the most ancient texts. The Galilean (Northern) location is familiar from the Christian gospels. However, a Southern (Judean) tradition is also attested in several early noncanonical texts. Modern-day Nazareth is nestled in a natural bowl which reaches from 1,050 feet (320 m) above sea level to the crest of the hills about 1,600 feet (490 m). Nazareth is about 25 kilometres (16 mi) from the Sea of Galilee (17 km as the crow flies) and about 9 kilometres (5.6 mi) west from Mount Tabor. The Nazareth Range, in which the town lies, is the southernmost of several parallel east-west hill ranges that characterize the elevated tableau of Lower Galilee. Nazareth is the largest Arab city in Israel. Until the beginning of theBritish Mandate in Palestine (1922–1948), the population was predominantly Arabic speaking Christian (majority Greek Orthodox), with an Arab Muslim minority. Nazareth today still has a significant Christian population, made up of Maronites, Greek Orthodox, Coptics, among others. The Muslim population has grown, for a number of historical factors, that include the city having served as administrative center under British rule, and the influx of internally displaced Palestinian Arabs absorbed into the city from neighbouring towns following the 1948 Palestine war. Its population remains almost exclusively Arab and numbered 64,800 in late 2009. Archaeological research revealed a funerary and cult center at Kfar HaHoresh, about two miles (3 km) from Nazareth, dating back roughly 9000 years (to what is known as the Pre-Pottery Neolithic B era).The remains of some 65 individuals were found, buried under huge horizontal headstone structures, some of which consisted of up to 3 tons of locally-produced white plaster. Decorated human skulls uncovered there have led archaeologists to believe that Kfar HaHoresh was a major cult centre in that remote era. In 1620 the Catholic Church purchased an area in the Nazareth basin measuring approx. 100 × 150 m (328.08 ft × 492.13 ft). on the side of the hill known as the Nebi Sa’in. This “Venerated Area” underwent extensive excavation in 1955-65 by the Franciscan priest Belarmino Bagatti, “Director of Christian Archaeology.” Fr. Bagatti has been the principal archaeologist at Nazareth. His book, Excavations in Nazareth(1969) is still the standard reference for the archaeology of the settlement, and is based on excavations at the Franciscan Venerated Area. Fr. Bagatti uncovered pottery dating from the Middle Bronze Age (2200 to 1500 BC) and ceramics, silos and grinding mills from the Iron Age (1500 to 586 BC), pointing to substantial settlement in the Nazareth basin at that time. However, lack of archaeological evidence fromAssyrian, Babylonian, Persian, Hellenistic or Early Roman times, at least in the major excavations between 1955 and 1990, shows that the settlement apparently came to an abrupt end about 720 BC, when many towns in the area were destroyed by the Assyrians. According to the Gospel of Luke, Nazareth was the home of Josephand Mary and the site of the Annunciation (when Mary was told by theAngel Gabriel that she would have Jesus as her son); in the Gospel of Matthew, Joseph and Mary resettle in Nazareth after fleeing to Egyptfrom their home in Bethlehem. The differences and possible contradictions between these two accounts of the nativity of Jesus are part of the Synoptic Problem. Nazareth is also allegedly where Jesus grew up from some point in his childhood. However, some modern scholars argue that Nazareth was also the birth place of Jesus. James Strange, an American archaeologist, notes: “Nazareth is not mentioned in ancient Jewish sources earlier than the third century AD. This likely reflects its lack of prominence both in Galilee and in Judaea. Strange originally speculated that the population of Nazareth at the time of Christ to be “roughly 1,600 to 2,000 people”, but later, in a subsequent publication, at “a maximum of about 480. In 2009 Israeli archaeologist Yardenna Alexandre excavated archaeological remains in Nazareth that might date to the time of Jesus in the early Roman period. Alexandre told reporters, “The discovery is of the utmost importance since it reveals for the very first time a house from the Jewish village of Nazareth. According to the Israel Antiquities Authority, “The artifacts recovered from inside the building were few and mostly included fragments of pottery vessels from the Early Roman period (the first and second centuries CE)… Another hewn pit, whose entrance was apparently camouflaged, was excavated and a few pottery sherds from the Early Roman period were found inside it.” Alexandre adds that “based on other excavations that I conducted in other villages in the region, this pit was probably hewn as part of the preparations by the Jews to protect themselves during the Great Revolt against the Romans in 67 CE”. Ancient Nazareth may have built on the hillside, as indicated in theGospel of Luke: [And they led Jesus] to the brow of the hill on which their city was built, that they might throw him down headlong. However, the hill in question (the Nebi Sa’in) is far too steep for ancient dwellings and averages a 14% grade in the venerated area. 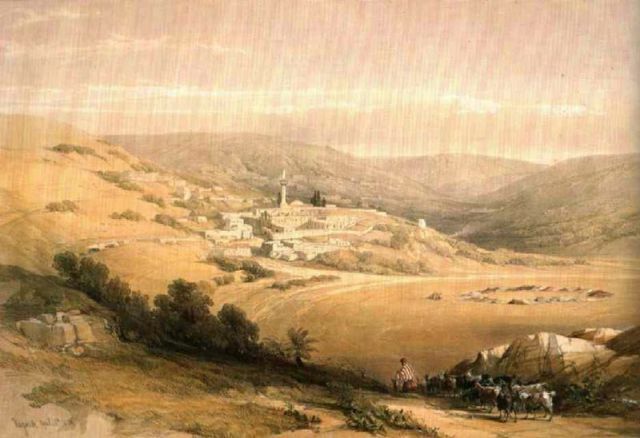 Historic Nazareth was essentially constructed in the valley; the windy hilltops in the vicinity have only been occupied since the construction ofNazareth Illit in 1957. Noteworthy is that all the post-Iron Age tombs in the Nazareth basin (approximately two dozen) are of the kokh(plural:kokhim) or later types; this type probably first appeared in Galilee in the middle of the first century AD. Kokh tombs in the Nazareth area have been excavated by B. Bagatti, N. Feig, Z. Yavor, and noted by Z. Gal. Excavations conducted prior to 1931 in the Franciscan venerated area revealed no trace of a Greek or Roman settlement there, Fr. Bagatti, who acted as the principal archaeologist for the venerated sites in Nazareth, unearthed quantities of later Roman and Byzantineartifacts, attesting to unambiguous human presence there from the 2nd century AD onward. John Dominic Crossan, a major figure in New Testament studies, remarked that Bagatti’s archaeological drawings indicate just how small the village actually was, suggesting that it was little more than an insignificant hamlet . Interior of St Joseph’s Church. In the Gospel of John, Nathaniel asks, “Can anything good come out of Nazareth?”[1:46] The meaning of this cryptic question is debated. Some commentators and scholars suggest that it means Nazareth was very small and unimportant, but the question does not speak of Nazareth’s size but of its goodness. In fact, Nazareth was described negatively by the evangelists; the Gospel of Mark argues that Nazareth did not believe in Jesus and therefore he could “do no mighty work there”; in the Gospel of Luke, the Nazarenes are portrayed as attempting to kill Jesus by throwing him off a cliff; in the Gospel of Thomas, and in all four canonical gospels, we read the famous saying that “a prophet is not without honor except in his own country. Many scholars since W. Wrede (in 1901) have noted the so-calledMessianic secret in the Gospel of Mark, whereby Jesus’ true nature and/or mission is portrayed as unseen by many, including by his inner circle of disciples (compare the Gospel of John‘s references to those to whom only the Father reveals Jesus will be saved). Nazareth, being the home of those near and dear to Jesus, apparently suffered negatively in relation to this doctrine. Thus, Nathanael’s question, “Can anything good come out of Nazareth?” is consistent with a negative view of Nazareth in the canonical gospels, and with the Johannine proclamation that even his brothers did not believe in him. A tablet at the Bibliothèque Nationale in Paris, dating to 50 AD, was sent from Nazareth to Paris in 1878. It contains an inscription known as the “Ordinance of Caesar” that outlines the penalty of death for those who violate tombs or graves. However, it is suspected that this inscription came to Nazareth from somewhere else (possiblySepphoris). Bagatti writes: “we are not certain that it was found in Nazareth, even though it came from Nazareth to Paris. At Nazareth there lived various vendors of antiquities who got ancient material from several places. C. Kopp is more definite: “It must be accepted with certainty that [the Ordinance of Caesar]… was brought to the Nazareth market by outside merchants. Princeton University archaeologist Jack Finegan describes additional archaeological evidence related to settlement in the Nazareth basin during the Bronze and Iron Ages, and states that “Nazareth was a strongly Jewish settlement in the Roman period. In the mid-1990s, shopkeeper Elias Shama discovered tunnels under his shop near Mary’s Well in Nazareth. The tunnels were eventually recognized as a hypocaust (a space below the floor into which warm air was pumped) for a bathhouse. The surrounding site was excavated in 1997-98 by Yardena Alexandre, and the archaeological remains exposed were ascertained to date from the Roman, Crusader, Mamlukand Ottoman periods. Epiphanius writes in the Panarion (c. 375 AD) of a certain elderly Count Joseph of Tiberias, a wealthy imperial Roman Jew who converted to Christianity in the time of Constantine. Count Joseph claimed that as a young man he built churches in Sepphoris and other towns that were inhabited only by Jews. Nazareth is mentioned, though the exact meaning is not clear. In any case, Joan Taylor writes: “It is now possible to conclude that there existed in Nazareth, from the first part of the fourth century, a small and unconventional church which encompassed a cave complex. The town was Jewish until the seventh century AD. Although mentioned in the New Testament gospels, there are no extant non-biblical references to Nazareth until around 200 AD, whenSextus Julius Africanus, cited by Eusebius (Church History 1.7.14), speaks of “Nazara” as a village in “Judea” and locates it near an as-yet unidentified “Cochaba. In the same passage Africanus writes of desposunoi – relatives of Jesus – who he claims kept the records of their descent with great care. A few authors have argued that the absence of first and second century textual references to Nazareth suggest the town may not have been inhabited in Jesus’ day.Proponents of this hypothesis have sought to buttress their case with linguistic, literary and archaeological interpretations, though mainstream historians and archaeologists dismiss such views as “archaeologically unsupportable”. In 1960, a Hebrew inscription found in Caesarea, dating to the late 3rd or early 4th century, mentions Nazareth as one of the places in which the priestly (kohanim) family of Hapizzez was residing after Bar Kokhba’s revolt (132-135 AD). From the three fragments that have been found, it is possible to show that the inscription was a complete list of the twenty-four priestly courses (cf. 1 Chronicles 24:7-19;Nehemiah 11;12), with each course (or family) assigned its proper order and the name of each town or village in Galilee where it settled. An interesting aspect of this inscription is that the name for Nazareth is not spelled with the “z” sound (as one would expect from the Greek gospels) but with the Hebrew tsade (thus “Nasareth” or “Natsareth”). Eleazar Kalir (a Hebrew Galilean poet variously dated from the sixth to tenth century A.D.) also mentions a locality clearly in the Nazareth region bearing the name Nazareth נצרת (in this case vocalized “Nitzrat”), which was home to the descendants of the 18thKohen clan or ‘priestly course‘, Happitzetz הפצץ, for at least several centuries following the Bar Kochva revolt. The Christian writer Jerome, writing in the 5th century, says Nazareth was a viculus or mere village. The Jewish town profited from the Christian pilgrim trade which began in the fourth century, but latent anti-Christian hostility broke out in 614 AD when the Persians invaded Palestine. At that time, according to C. Kopp writing in 1938, the Jewish residents of Nazareth helped the Persians slaughter the Christians in the land. When the Byzantine or Eastern Romanemperor Heraclius ejected the Persians from Palestine in 630 AD, he singled out Nazareth for special punishment and imposed forced exile upon the Jewish families. At this time the town ceased to be Jewish. The Muslim conquest of Palestine in 637 AD introduced Islam to the region. Over the next four centuries Islam was adopted by a significant portion of the population, though a significant Arab Christian minority remained. With outbreak of theFirst Crusade, an extended period of conflict began in which control shifted several times between the local Saracens and Europeans. Control over Galilee and Nazareth shifted frequently during this time, with corresponding impact on the religious makeup of the population. In 1099 AD, the Crusader Tancred captured Galilee and established his capital in Nazareth. The ancient diocese of Scythopolis was also relocated under the Archbishop of Nazareth, one of the four archdioceses in the Kingdom of Jerusalem. The town returned to Muslim control in 1187 AD following the victory of Saladin in the Battle of Hattin. The remaining Crusaders and European clergy were forced to leave town.Frederick II managed to negotiate safe passage for pilgrims from Acre in 1229, and in 1251, Louis IX, the king of France, attended mass in the grotto, accompanied by his wife. In 1263, Baybars, the Mamluk Sultan, destroyed the Christian buildings in Nazareth and declared the site off-limits to Latin clergy, as part of his bid to drive out the remaining Crusaders from Palestine. While Arab Christian families continued to live in Nazareth, its status was reduced to that of a poor village. Pilgrims who visited the site in 1294 reported only a small church protecting the grotto. In the 14th century, monks from the Franciscan Order were permitted to return and resided within the ruins of the Basilica, but they were eventually evicted again in 1584. In 1620, Fakhr-al-Din II, a Druzeemir who controlled this part of Ottoman Syria rule, permitted them to return to build a small church at the Grotto of the Annunciation. Pilgrimage tours to surrounding sacred sites were also organized by the Franciscans from this point forward, but the monks suffered harassment from surrounding Bedouin tribes who often kipnapped them for ransom. Stability returned with the rule of Daher el-Omar, a powerful local sheikh who ruled over much of the Galilee and who authorized the Franciscans to build a church in 1730. That structure stood until 1955, when it was demolished to make way for the building a larger structure which was completed in 1967. Nazareth was captured by the troops of Napoleon Bonaparte in 1799, during his Syrian campaign. Napoleon visited the holy sites and considered appointing his general Junot as the duke of Nazareth.During the rule of Ibrahim Pasha (1830–1840), the Egyptian general, over much of Ottoman Syria, Nazareth was open to European missionaries and traders. After the Ottomans regained control, European money continued to flow into Nazareth and a number of institutions were established. The Christians of Naareth were protected during the pogroms of 1860s by the dominant rule of Aghil Agha, the Bedouin leader who exercised control over the political and security situation in the Galilee between 1845 and 1870. Kaloost Varstan, an Armenian from Istanbul, arrived in 1864 and established the first medical missionary in Nazareth, the Scottish “hospital on the hill”, with sponsorship from the Edinburgh Medical Missionary Society. The Ottoman Sultan, who favored the French, allowed them to establish an orphanage, the Society of Saint Francis de Sale. 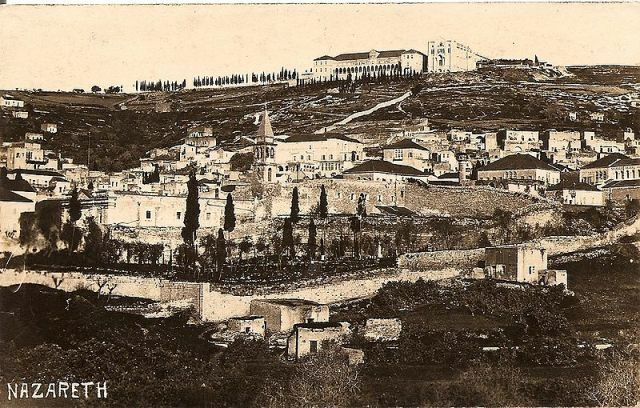 By the late 19th century, Nazareth was a town with a strong Arab Christian presence and a growing European community, where a number of communal projects were undertaken and new religious buildings were erected. 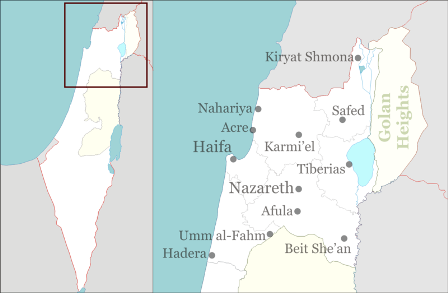 Nazareth was in the territory allotted to the Arab state under the 1947 UN Partition Plan. The town was not a field of battle during 1948 Arab-Israeli War before the first truce on 11 June, although some of the villagers had joined the loosely organized peasant military and paramilitary forces, and troops from the Arab Liberation Army had entered Nazareth. During the ten days of fighting which occurred between the first and second truce, Nazareth capitulated to Israeli troops during Operation Dekel on 16 June, after little more than token resistance. The surrender was formalized in a written agreement, where the town leaders agreed to cease hostilities in return for promises from the Israeli officers, including brigade commander Ben Dunkelman (the leader of the operation), that no harm would come to the civilians of the town. Preparations for the Pope‘s visit to Nazareth in 2000 triggered highly publicized tensions related to the Basilica of the Annunciation. The 1997 permission for construction of a paved plaza to handle the expected thousands of Christian pilgrims caused Muslim protests and occupation of the proposed site, which is considered the grave of a nephew of Saladin. This site used to be the home of a school built during the Ottoman rule. The school was named al-Harbyeh (in Arabic means military), and many elderly people in Nazareth still remember it as the school site, nevertheless, the same site still contains,the Shihab-Eddin shrine, along with several shops owned by the waqf(Muslim community ownership). The school building continued to serve as a government school until it was demolished to allow for the plaza to be built. The initial argument between the different political factions in town (represented in the local council), was on where the borders of the shrine and shops starts and where it ends. The initial government approval of subsequent plans for a large mosque to be constructed at the site led to protests from Christian leaders worldwide, which continued after the papal visit. Finally, in 2002, a special government commission permanently halted construction of the mosque. 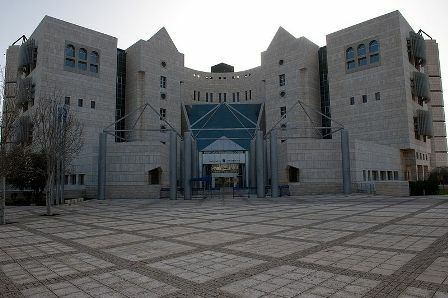 In March 2006, public protests that followed the disruption of a Lenten prayer service by an Israeli Jew and his Christian wife and daughter, who detonated incendiary devices inside the church, succeeded in dismantling a temporary wall that had been erected around the public square that had been constructed but had yet to be unveiled, putting an end to the entire controversy. On 19 July 2006 a rocket fired by Hezbollah as part of the 2006 Israel-Lebanon conflict killed two children in Nazareth. No holy sites were damaged. In 2007, a group of Christian businessmen declared plans to build the largest cross in the world (60 m (196.85 ft) high) in Nazareth as the childhood town of Jesus. 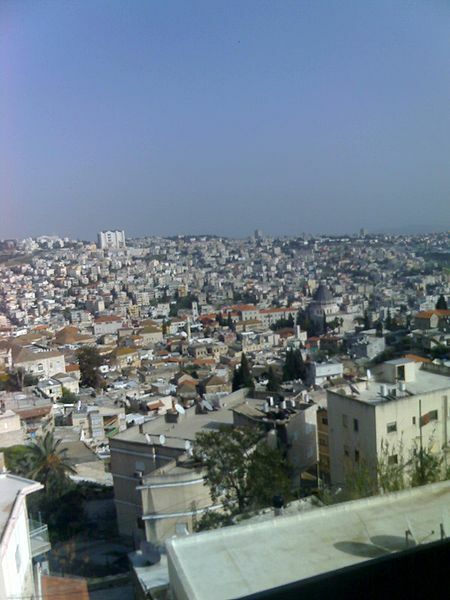 According to the Israel Central Bureau of Statistics, Nazareth had a population of approximately 65,000 in 2005. The vast majority of its residents are Arab citizens of Israel, 31.3% of whom are Christiansand 68.7% of whom are Muslims. 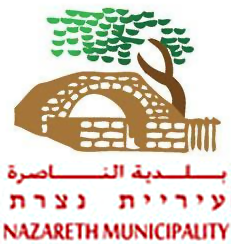 Nazareth forms a metropolitan area with the Arab local councils of Yafa an-Naseriyye to the south,Reineh, Mashhad and Kafr Kanna to the north, Iksal and the adjacent Jewish cities of Nazareth Illit to the east which has a population of 41,000 Jews and Migdal HaEmek to the west with a population of 25,000 Jews. Together, the Nazareth metropolis area has a population of approximately 210,000 of which over 125,000 (59%) are Israeli Arabs, and 85,000 are Israeli Jews (41%), making it the only urban area with over 50,000 residents in Israel where the majority of the population is Arabic. While the two communities of Muslims and Christians tend to get along, they also have come into sporadic conflict. Muslim activists outraged Christians when they built an unauthorized mosque next to the Basilica of the Annunciation, where Christians believe the Angel Gabriel foretold the birth of Jesus to Mary. Israel later tore down the mosque in 2003. Muslim activists also have periodically marched through the city in shows of strength meant to intimidate Christians. 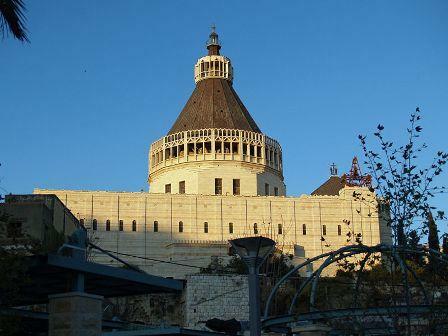 Nazareth is home to at least 23 monasteries and churches. Many of the older churches are located in the Old City. The Church of the Annunciation is the largest Christian church building in the Middle East. In Roman Catholic tradition, it marks the site where the Archangel Gabriel announced the future birth of Jesus to the Virgin Mary (Luke 1:26-31). 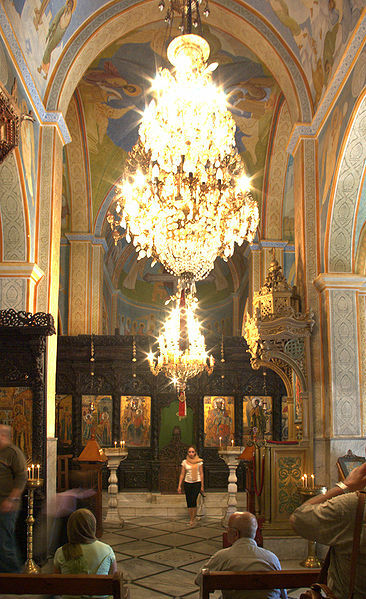 The Eastern Orthodox Church constructed St. Gabriel’s Church at an alternative site for the Annunciation. The Basilica of Jesus the Adolescent, run by the Salesianreligious order, occupies a hill overlooking the city. The Church of Christ is an Anglican church in Nazareth. 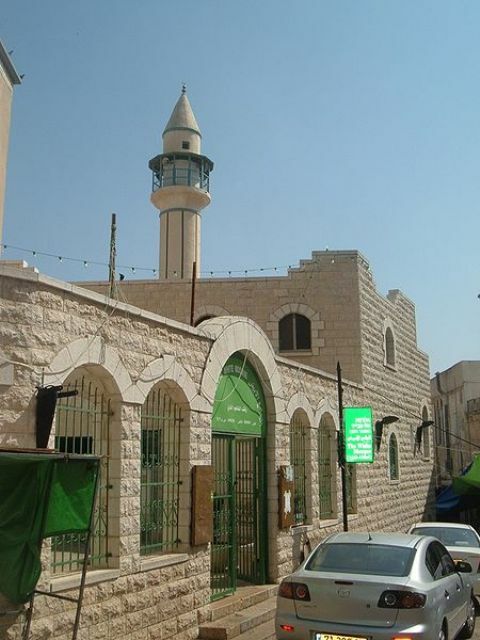 There are also a number of mosques in Nazareth, the oldest of which is the White Mosque, located in Harat Alghama (“Mosque Quarter”) in the center of Nazareth’s Old Market. The White Mosque (Arabic: المسجد الأبيض‎) is the oldest mosque in Nazareth,Israel and is located in Harat Alghama or the “Mosque Quarter” in the center of Nazareth’s Old Market. Its exquisite pencil-shapedminaret,cream-coloured walls, green trim and green dome are just one example of the Ottoman architecture common throughout the city. The construction of the mosque was funded by the Egyptian rulerSuleiman Pasha in the latter half of the eighteenth century, and overseen by the high commissioner of Nazareth, Sheikh Abdullah al-Fahoum. The mosque was completed between 1804 and 1808 and Sheikh Abdullah was granted trusteeship over it in the form of a waqfand administered it until the time of his death in 1815. The tomb of Sheikh Abdullah is in the mosque’s courtyard. After Sheikh Abdullah’s death, the managing of the mosque’s affairs were transferred to Sheikh Amin al-Fahoum. Presently, the mosque continues to form part of the al-Fahoum family waqf, which also includes the khan of the pasha on Casa Nova street. It is administered by one of Sheikh Abdullah’s descendants, ‘Atif al-Fahoum. The mosque was named by Sheikh Abdullah to mark the end of the reign of the former Ottoman governor, Jezzar Pasha, predecessor to Suleiman Pasha. Sheikh Abdullah chose “white” to symbolize a new era of purity, light and peace to be enjoyed between the faiths in Nazareth. On a regular day, between 100 to 200 persons attend the noon and afternoon prayer services, while the Friday sermon is attended by 2,000 to 3,000 people. The mosque serves Nazareth’s Muslim community by offering religious classes for young men and sponsoring the Muslim scout troop in which 400 boys and girls ages 9 and older participate. The mosque also houses a museum with exhibits that document Nazareth’s history. ^ a b c d e f g Chad F. Emmett (1995). Beyond the Basilica: Christians and Muslims in Nazareth. University of Chicago Press. p. 136–138. ISBN 0226207110. ^ a b c d e “Nazareth: The Mosque Quarter”. Discover Israel.http://www.ddtravel-acc.com/nazareth.htm. Retrieved 2007-12-01. ^ “Galilee:Nazareth”. ThinkIsrael.com.http://www.goisrael.com/NR/exeres/39B6F59F-DDA1-4568-8669-F2944873B785.htm. Retrieved 2007-12-01. This entry was posted on February 10, 2012 at 3:05 pm and is filed under WORLD'S HISTORY. You can follow any responses to this entry through the RSS 2.0 feed. You can leave a response, or trackback from your own site.